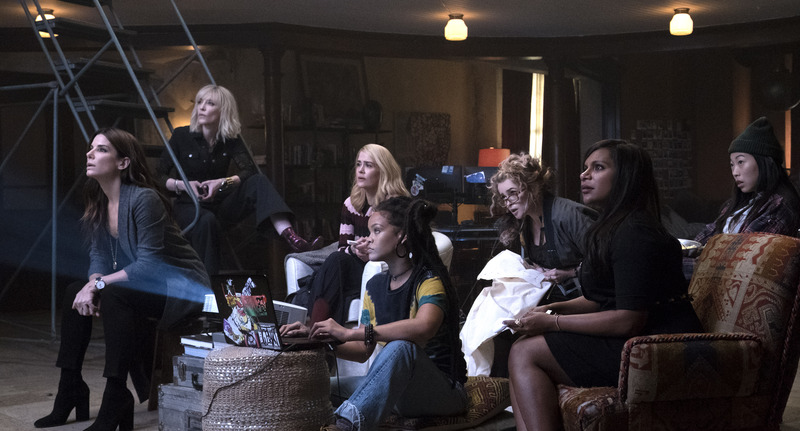 If you watched the criminally good Ocean’s 8 movie trailer and thought to yourself, I bet those women had the time of their lives filming this, you’re absolutely right. Sandra Bullock, Cate Blanchett, Mindy Kaling, Sarah Paulson, Awkwafina, Rihanna, and Helena Bonham Carter star as partners in crime out to steal a $150 million Cartier diamond necklace from Anne Hathaway’s neck at the Met Gala. And as we expected, they had just as much fun off camera as they did on camera. The love among the cast members was on full display at the Ocean’s 8 press conference in New York City on Tuesday, May 22nd. When asked if the group participated in any bonding exercises or took any outings to get to know each other, Sandra Bullock had the perfect response: “Kegels. We’re doing them right now.” But jokes aside, she opened up about just how close the eight women became during filming. By “vomit fest,” Bullock means that she felt comfortable gushing about how comfortable she was. She said she went into Ocean’s 8 hoping the group would grow close, and was so happy when it actually happened. "I went in hoping — and you don't always get what you hope for — and by the end, I think long past this film is out, I think we managed to connect on a level that we never ever had been given a chance [to do]," Bullock continued. "There's five roles [for women in Hollywood] and we're all sort of just looking for them, and they're all lone, little islands. And here we were, Hawaii, and all the other islands." Anne Hathaway chimed in, piggybacking on what Bullock said about usually feeling isolated on sets and how she didn’t feel that way filming Ocean’s 8. "One of the things I remember was the moment when I realized I didn't have to put a filter on. What you said about feeling like an island on the set — I was used to that. I've been really lucky. I've worked with a lot of great women, but there's usually just one or two of us. The idea that we could all bring all the experience we've ever had, and put it into this shared pool, and all then collectively become better because we were all just together. That was one of the first things that I remembered — was feeling safe, and feeling like I was with people I felt so proud to be amongst, while having the best time of my life learning and enjoying the view. It was incredible." Bullock had a little bit more gushing to do about her Ocean’s 8 co-stars. "I feel really lucky. I feel really lucky, because there's no more stones I need to turn over. And on this one, I really feel that I came out with so much more than I ever imagined. They might not feel the same, but I feel very lucky." Of course, Sarah Paulson chimed in to hilariously (and jokingly, of course) ruin the moment: “Nope. Don’t feel that way AT ALL.” Classic Sarah.